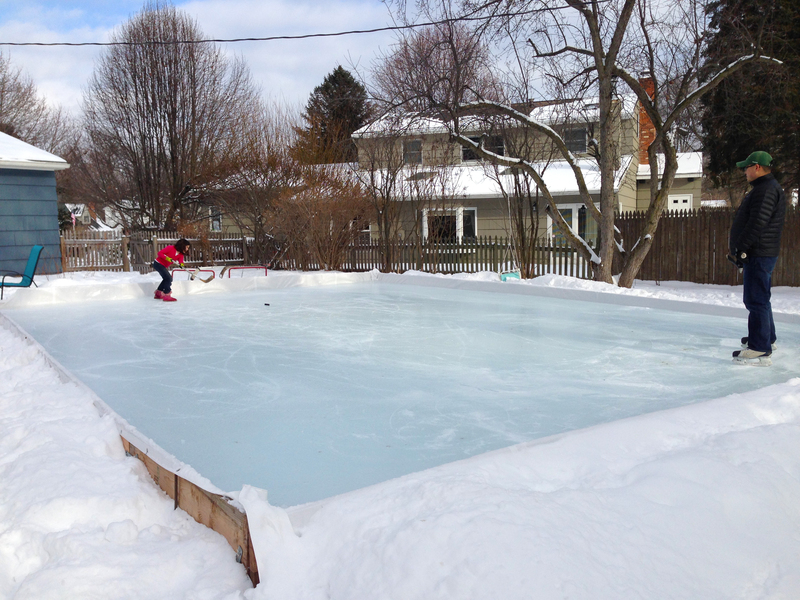 Here’s the thing about having a skating rink in your backyard: it’s not for the faint of heart. It seems so sweet and idyllic, right? 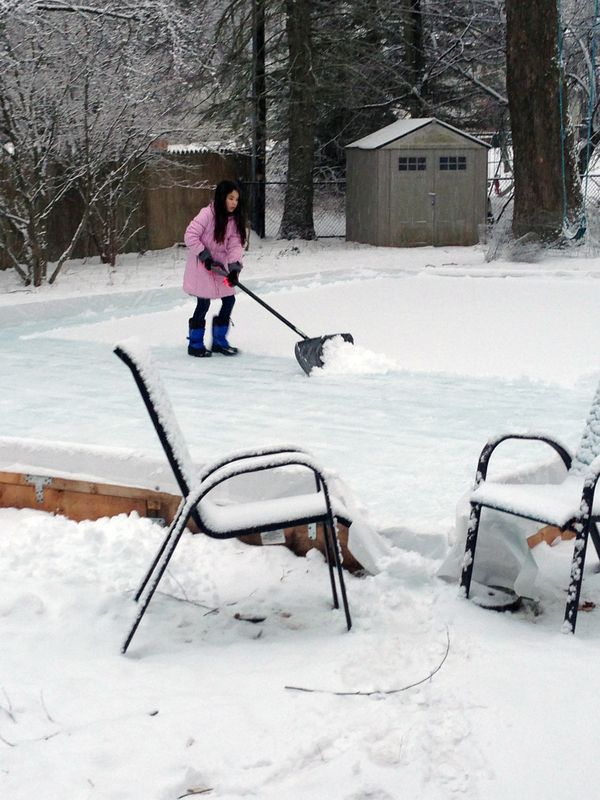 Your own private skating oasis; gleaming ice ready any time you want to use it; no one rushing you or bumping into you, no waiting for the Zamboni to finish, no new-fangled music that’s all the rage with kids these days; a cozy house to warm up inside; hot chocolate simmering on the stove. In reality, you do have your own oasis – that much is true – but you have got to work for it, from the moment you lay down the framing and the tarp to the day you call it quits for the season. 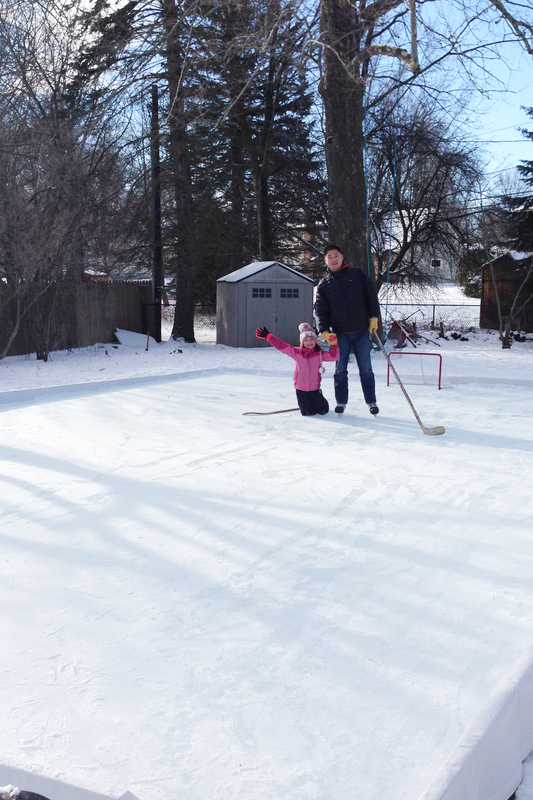 It’s a commitment, this rink thing – one that, in many ways, must be undertaken by the entire family. 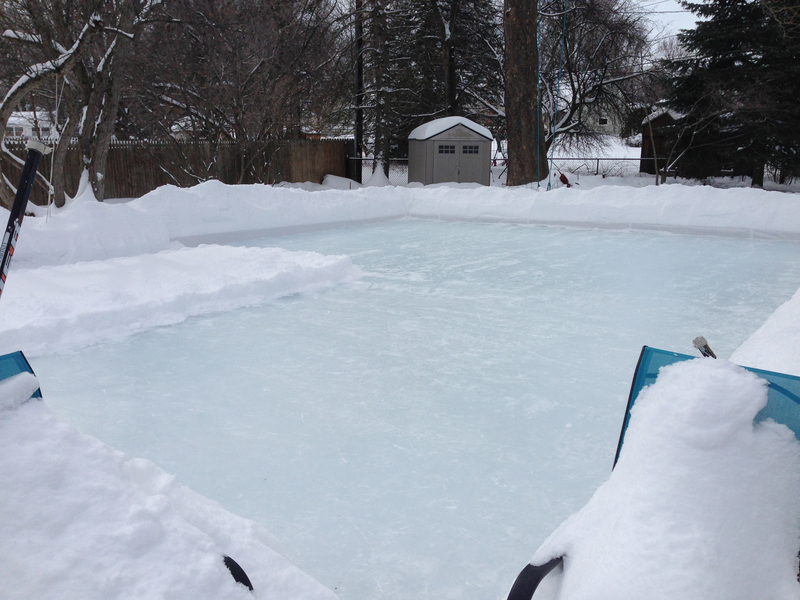 (I remember a neighbor, years ago, telling me that they too used to have a backyard rink but they’d finally scrapped it after she got tired of her husband calling when he was out of town and asking her to shovel it. I laughed at the time. 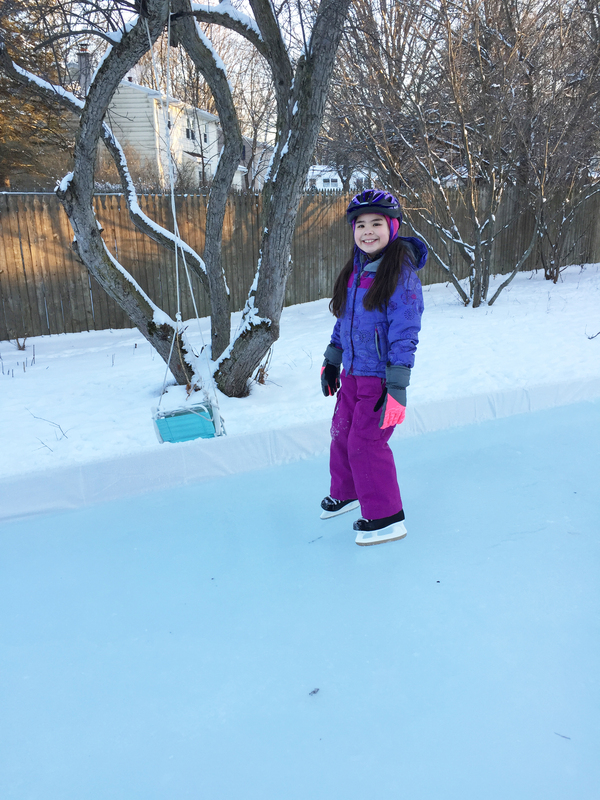 We’ve had our rink for four or five years now, and each year we learn something new: how and when to flood it (a layer at a time or all at once? Before the first big freeze or not until you’ve got several sub-freezing days in a row? ), how deep to fill it, where in the yard to put it, how often – and with what – to clear it off, how to smooth out the inevitable bumps, how to avoid chips and cracks, what kind of tarp to use, how to secure the tarp, how large the frame should be, and so on. 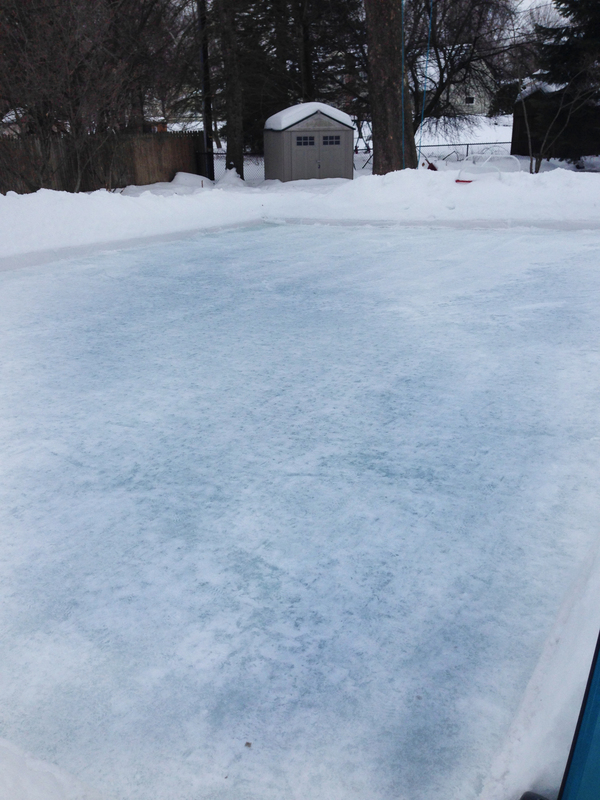 But, in the end, the hard work paid off because two days later: strong, skate-ready ice. We were so excited to use it, we couldn’t wait until the following morning. Who needs sun when you have floodlights?? 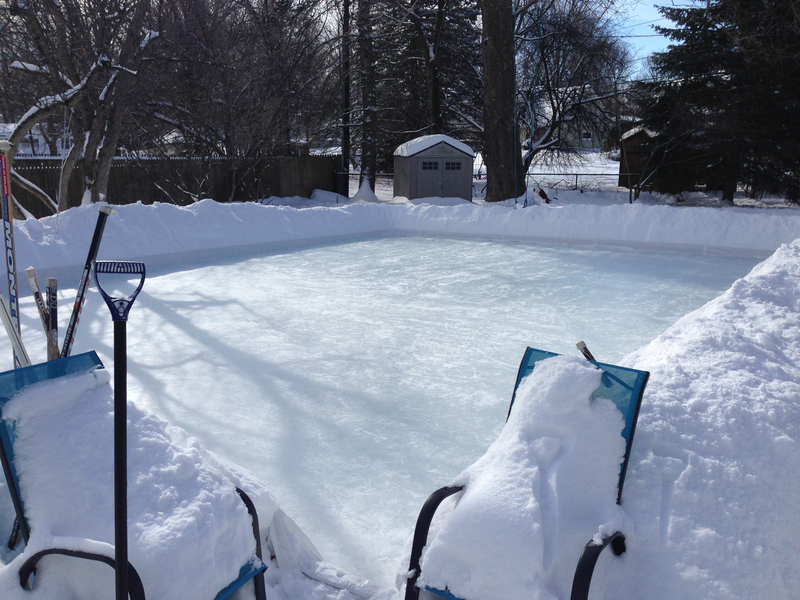 What followed have been – absolutely – many many idyllic afternoons, evenings, mornings, and weekends spent on that rink. 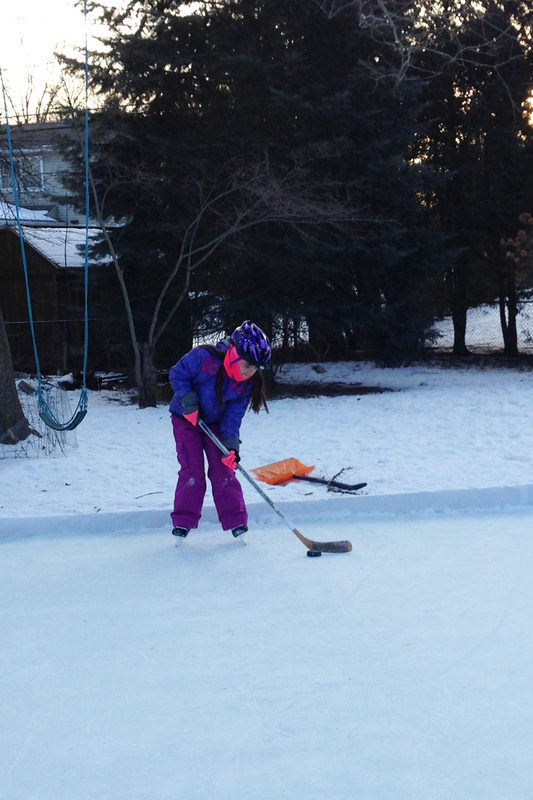 We’ve gone through gallons (literally) of hot cocoa, seemingly never-ending bowls of popcorn, numerous skate guards, at least one broken hockey stick, and dozens of pucks – long buried in the snow. In a lot of ways, it really has been sweet and idyllic. 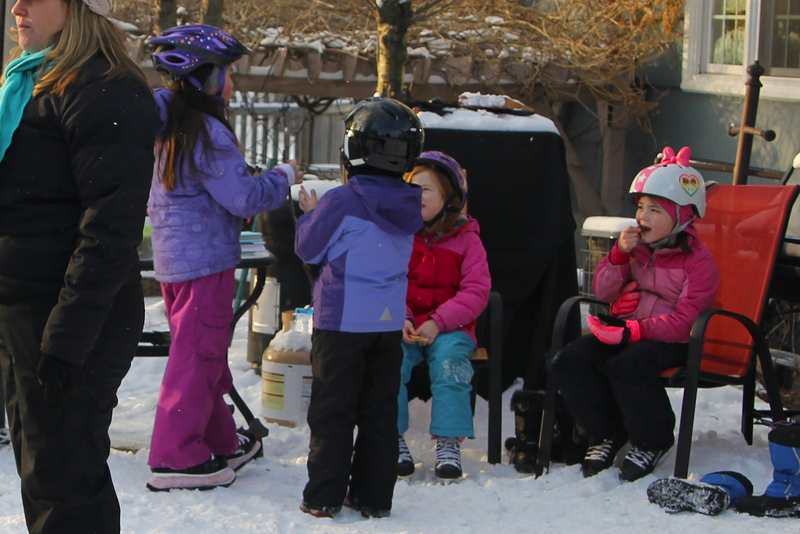 This is pretty much my dream winter set-up: perfect rink, fire in the fire pit, path for friends and neighbors to join us. 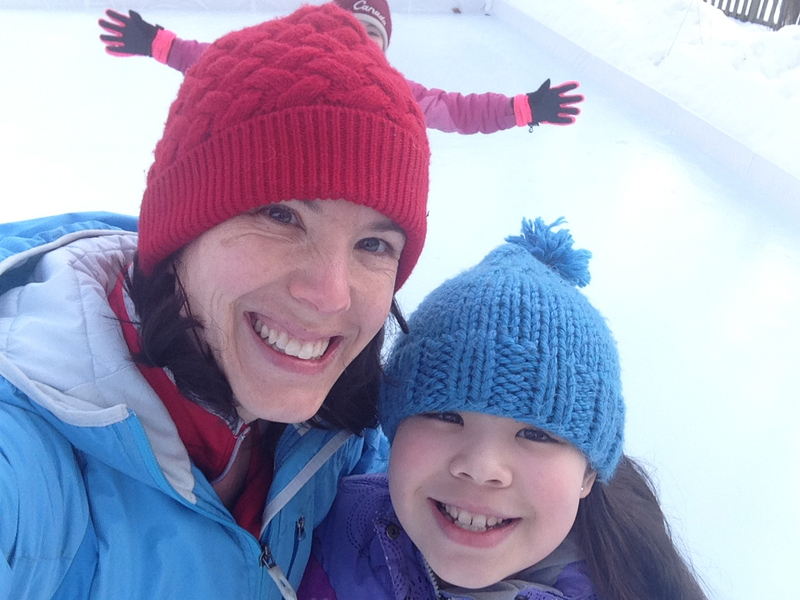 Much to my dismay, however, a smooth, skateable, nicely maintained ice rink does not just happen by magic (no matter how many Harry Potter spells I try). First, there is shoveling. When the snow is minimal, we use our indentured servants to help. Next, there is more shoveling. 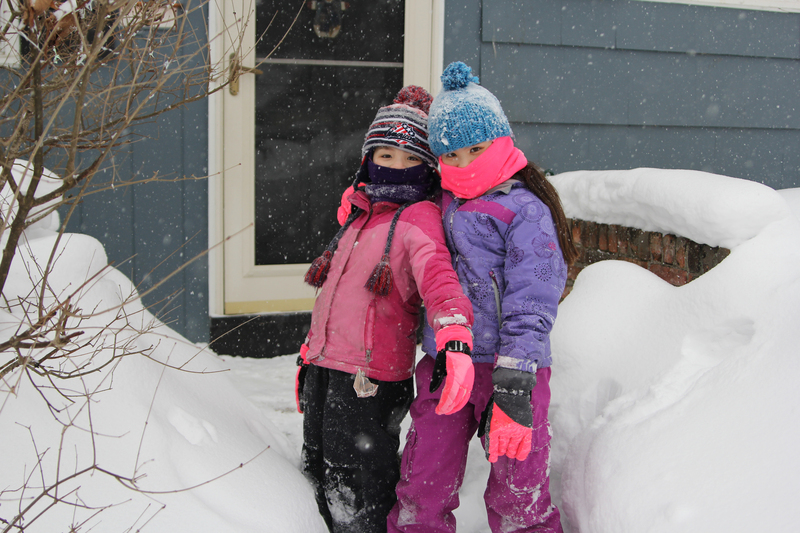 What’s more fun that shoving ten inches of snow off the driveway? 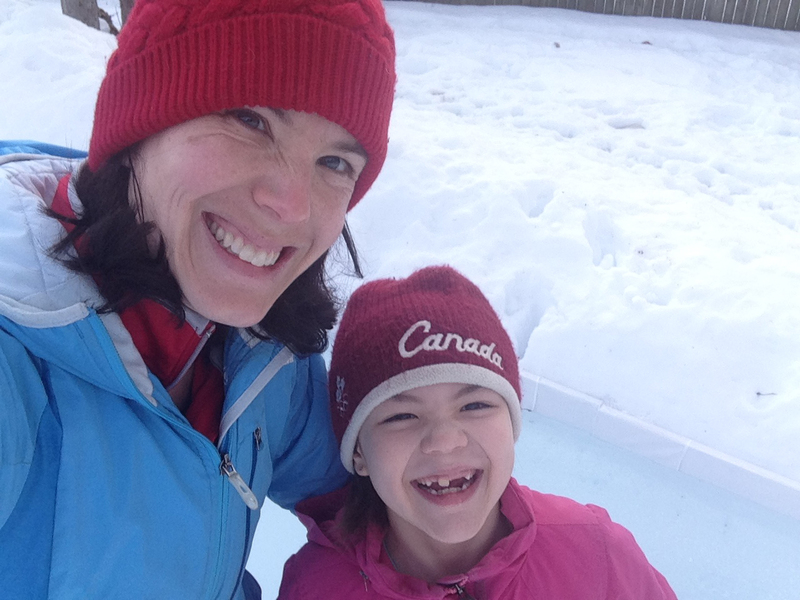 Shoveling ten inches of snow off the driveway and the ice rink! 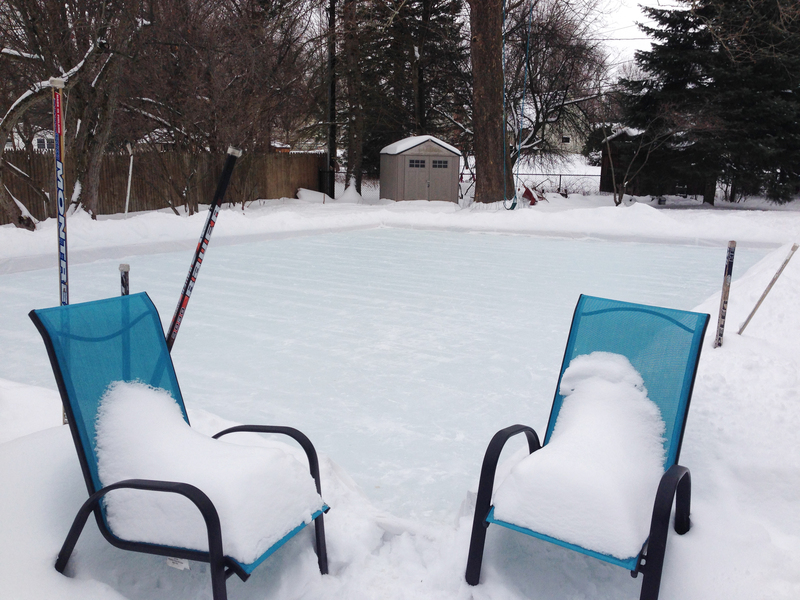 As we’ve learned the hard way, you can’t just let the snow sit on the rink, no matter how much you’d rather relax on the couch. It creates this insulated cover and blah blah insert something science-y here and before you know it, the ice is all melty and bumpy and weird and then you have to not only shovel but also scrape the lumps off and fill in the holes. 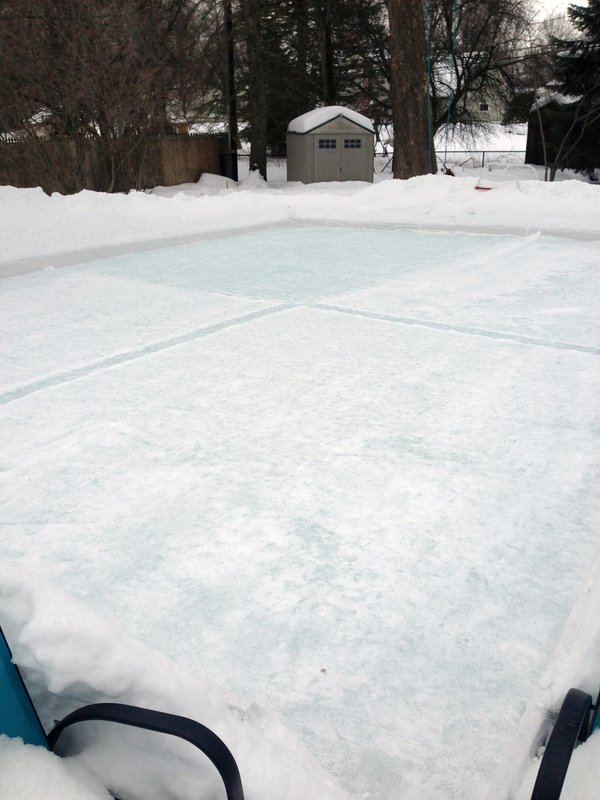 Exhibit A: the rink after our one and only day of sleet this year. 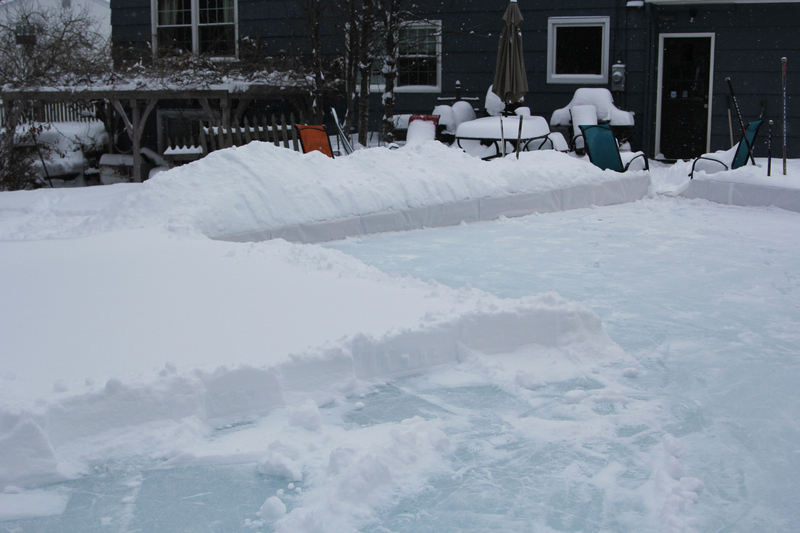 This was after I’d already shoveled. It was basically very cold sandpaper. That one corner took 45 minutes. THIS IS A LABOR OF LOVE, PEOPLE. A very labor-ful labor of love. Long story short, it really works best to shovel that puppy clean as soon as you can – which, in our case, means removing snow from an 816 square foot surface. On purpose. Voluntarily. We choose to shovel 816 square feet of snow in addition to our driveway and front walk basically every time it snows – whether it’s an inch or a foot, whether Nick is home or out of town, whether it’s below zero or above freezing – because we have a doggone ice rink in the back yard and we’ll be damned if we let it go to hell in a hand basket! See what I mean about the whole commitment thing? 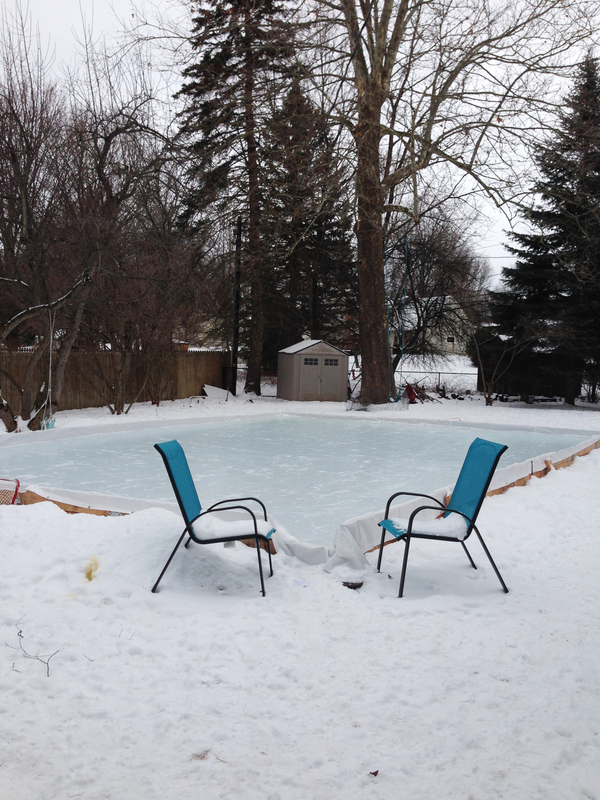 A (functional) backyard ice rink is a really bad idea if you’d rather hibernate in the winter. I’m melllting! What a world! 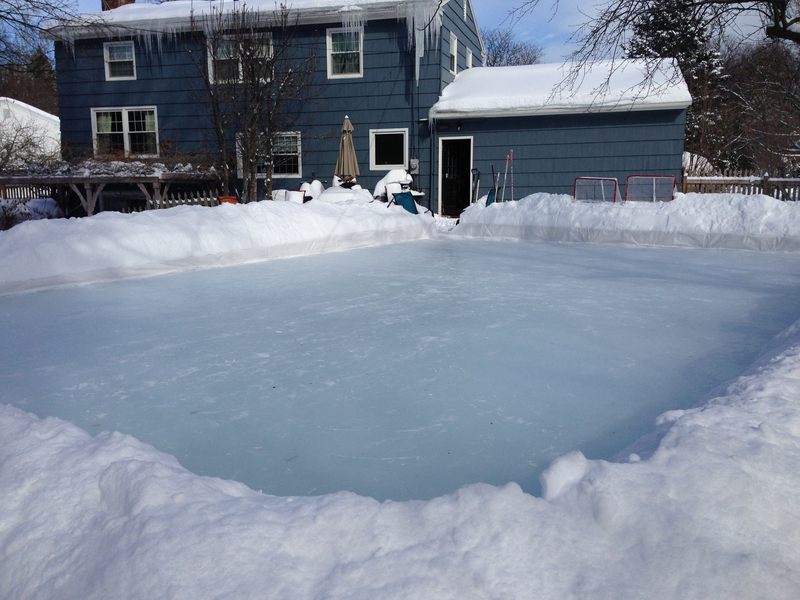 In addition to shoveling and clearing, there is also the flooding of the rink – sometimes with the hose, sometimes with buckets of hot water; sometimes a thin layer over the entire surface, sometimes just a bit here and there. If you do it when it’s snowing, the snow can freeze into the ice layer and cause bumps. If you wait until it’s warmer, the ice won’t set properly. It’s a science, but a very inexact one; maybe this is what it’s like to be a meteorologist. Oh! And there is also… shoveling. First step: clear the edges and divide into fourths. Next: make sure someone has a bottle of Aleve waiting inside. At least you won’t need to go to the gym today! Finally! If you’re not too sore, you can skate! You might think, with all of the work – with the backaches and the frostbitten fingers, the late nights spent waiting for just the right time to lay down another coat of water – that it’s somehow not worth it. But, oh. You’d be wrong. It’s quiet in the backyard. You can barely see the cars in the cul-de-sac; for all you know, you’re the only people around. 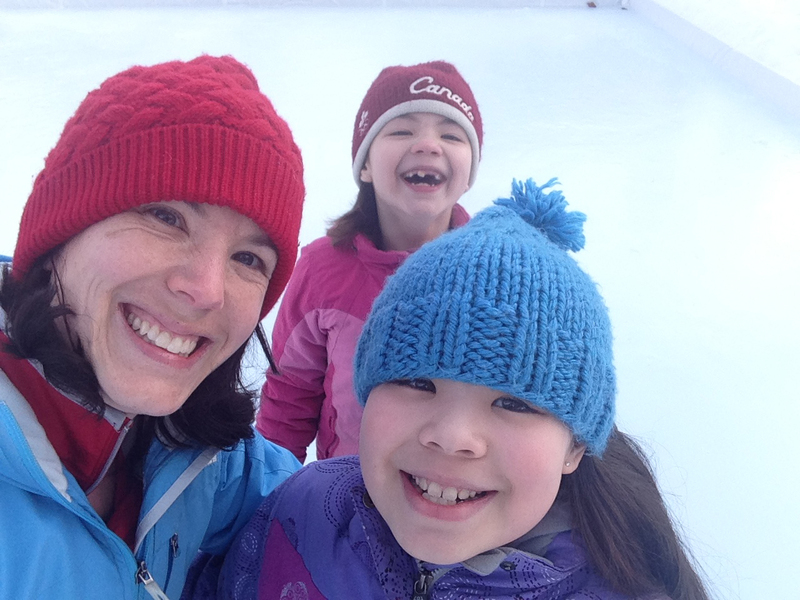 Your skates sound so crisp as they scrape along the ice, carving pathways and messages. No matter what else is going on – the vomiting dog, the broken car, the fighting children, the burned dinner, the crazy project, the looming deadline – everything seems to fade away the moment you step foot (skate?) on the ice. You see beauty, too, in places you hadn’t before – the ice takes on different hues depending on the time of day, how sunny it is, how much snow is surrounding the rink. It’s like looking out onto an ever-changing portrait… except nothing has changed at all but your perspective. See what I mean? 8 a.m…. As I mentioned earlier, this winter started off relatively mildly; we didn’t have much snow (for Rochester) through January. As February wore on, we saw not only the coldest month in Rochester’s history but also an additional 50″ of snow. Although we normally see that much snow (twice it, actually) over the course of each winter, it typically falls in a steadier fashion rather than a lot at once. 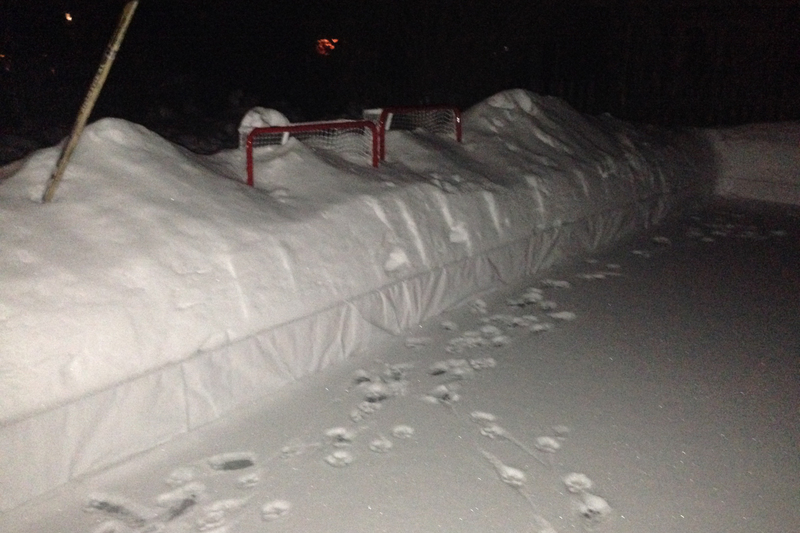 This was, therefore, the first year where we had significant snow build-up around the outside of the rink. Personally, I think it added to the isolated, idyllic feel. Early January was pretty slow. By mid-January, the ground cover was solid. By early February, the rounded edges had begun to form. Then came… OMG SO MUCH SNOW. 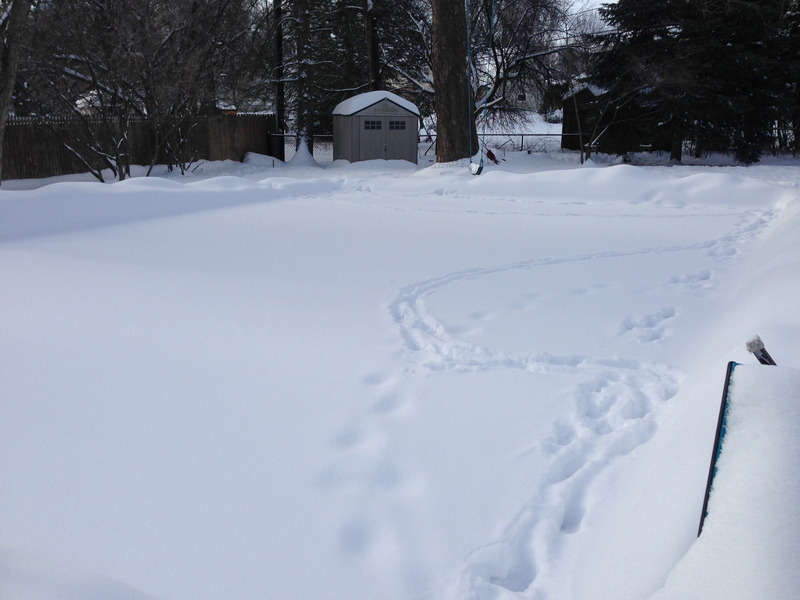 By the end of the month, the rink was completely encircled. 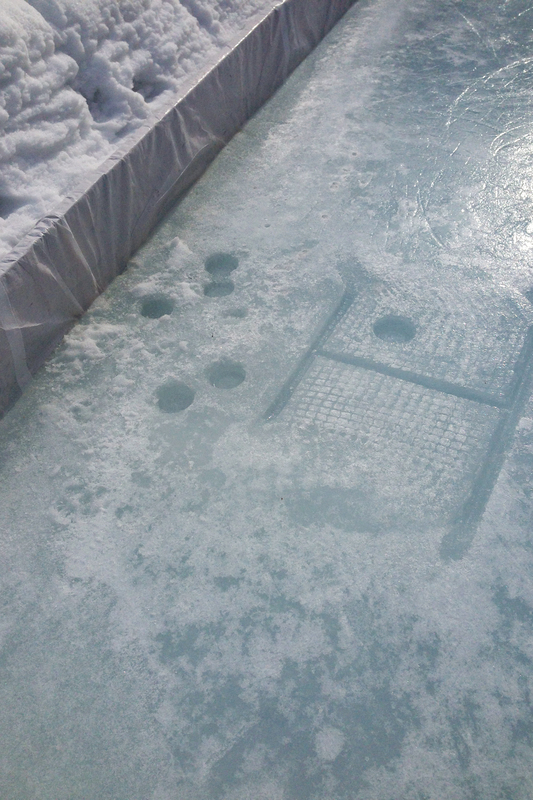 All of our previous rinks have been just fine, but there’s always been at least one problem with each of them. Some never properly froze over. 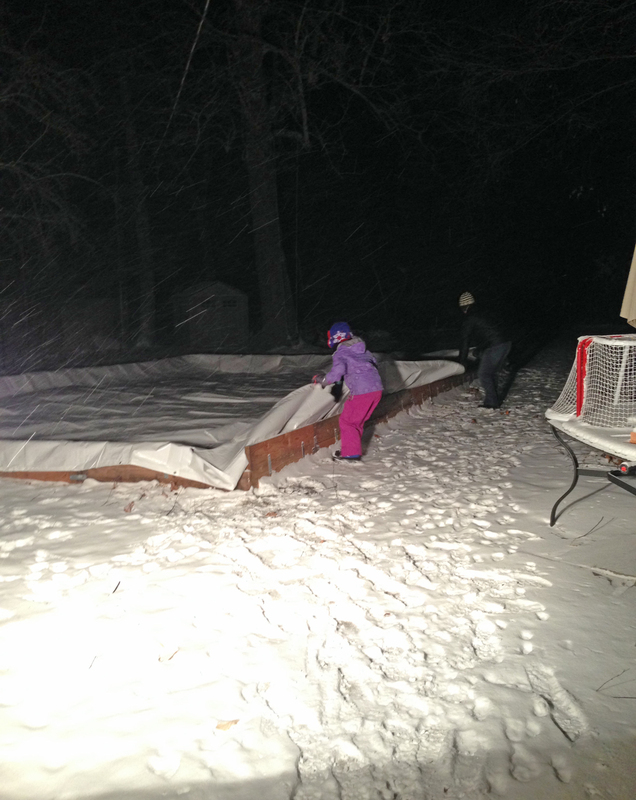 Others were inadequately flooded, resulting in chipping ice and exposed tarp (we prefer more modest tarps over here). Still other years we didn’t get ourselves out to the ice quickly enough to clear away the snow; when you don’t commit, it isn’t pretty. This year, the stars aligned. 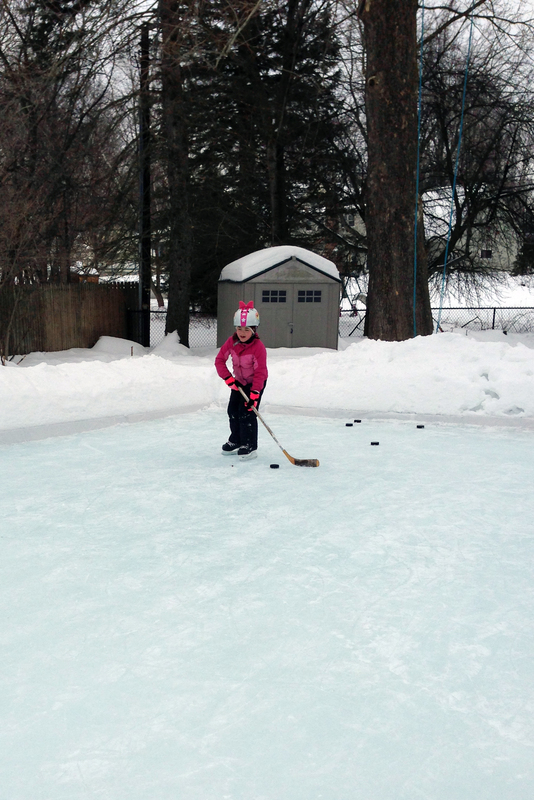 The cold February made for fantastic ice conditions. 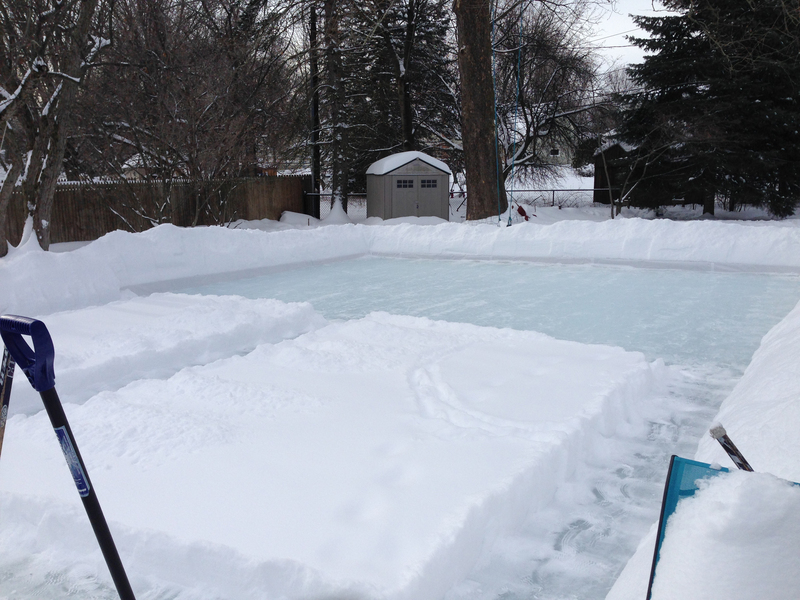 We finally understood how and when to fill the rink. 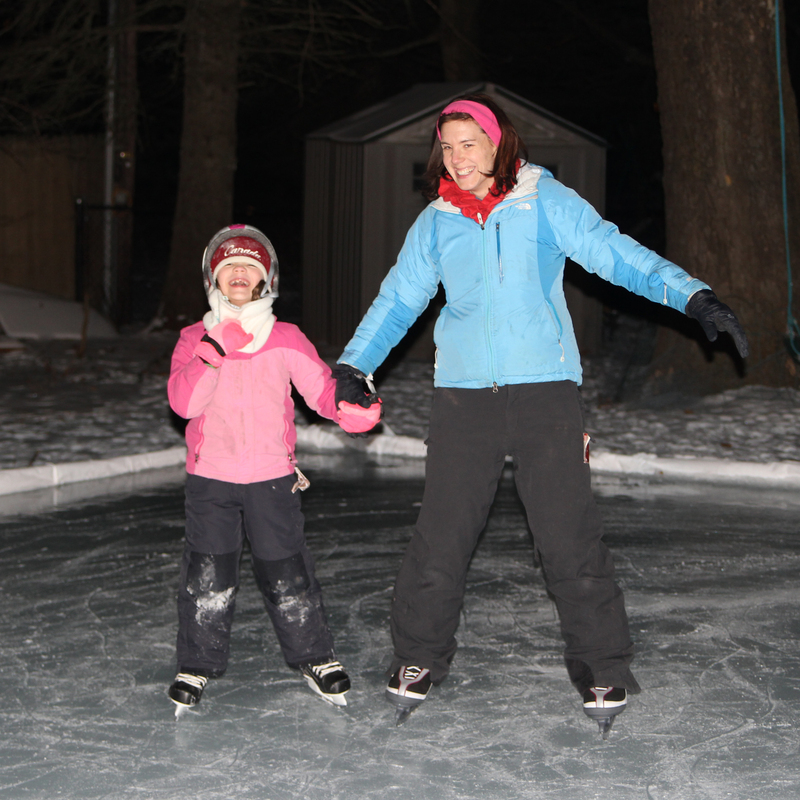 We purchased portable floodlights so we could skate after dark. 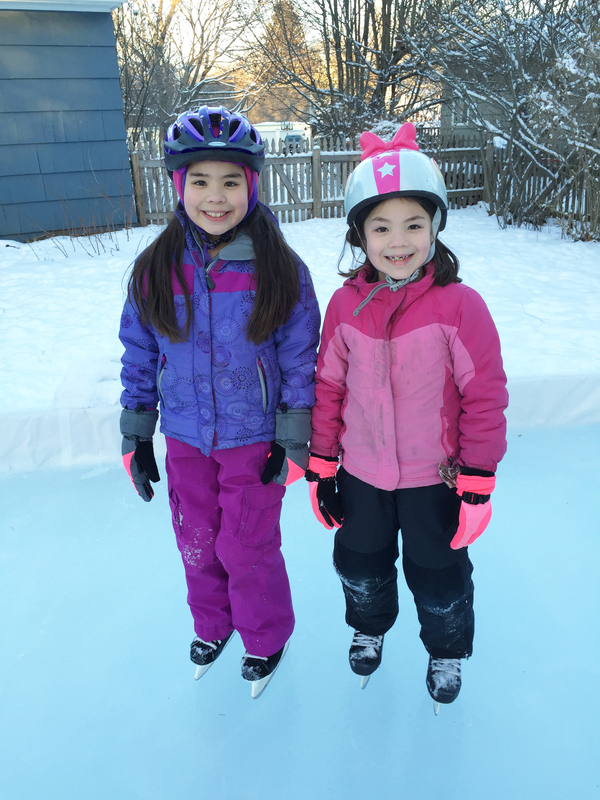 We learned from our past mistakes and were bound and determined to make sure that we took good care of the surface, to keep it clear and shoveled and smooth so that, any time – day or night – we can pop on our skates and go for a spin. Quite frankly, we’ve all been loving it so much, it’s almost been easy. (In the emotional sense. Physically? NOT SO MUCH.) We’ve skated ourselves silly on that rink. 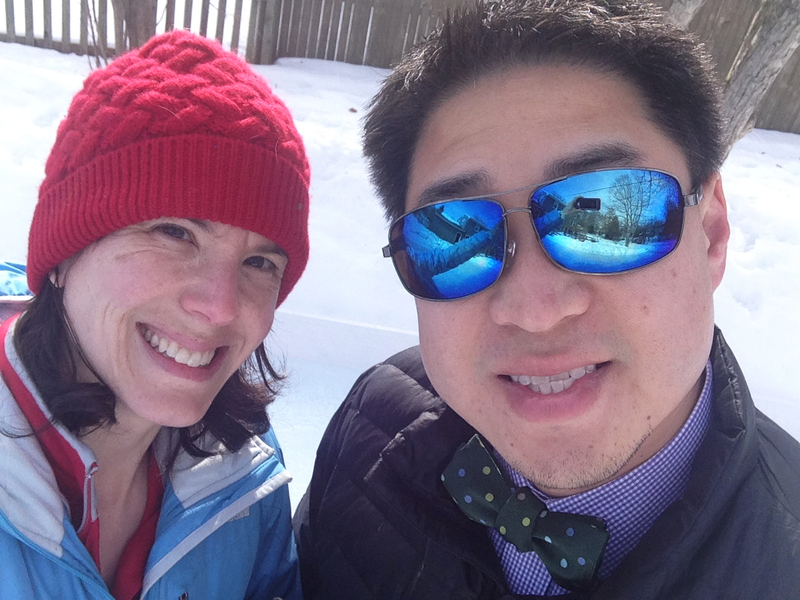 The frigid temperatures and unrelenting snow persisted well into March like a stubborn child’s tantrum – until, just like that, they’d exhausted themselves and were done. This week has brought forty degree temperature increases and days of glorious sunshine. Because the past month has been so brutal, the return of spring feels nothing short of miraculous. 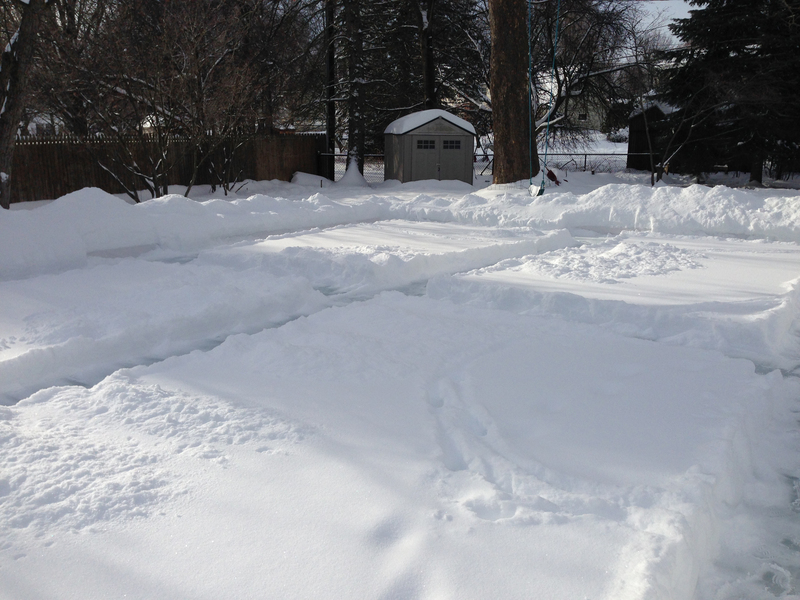 But I am sad to say goodbye to our rink. 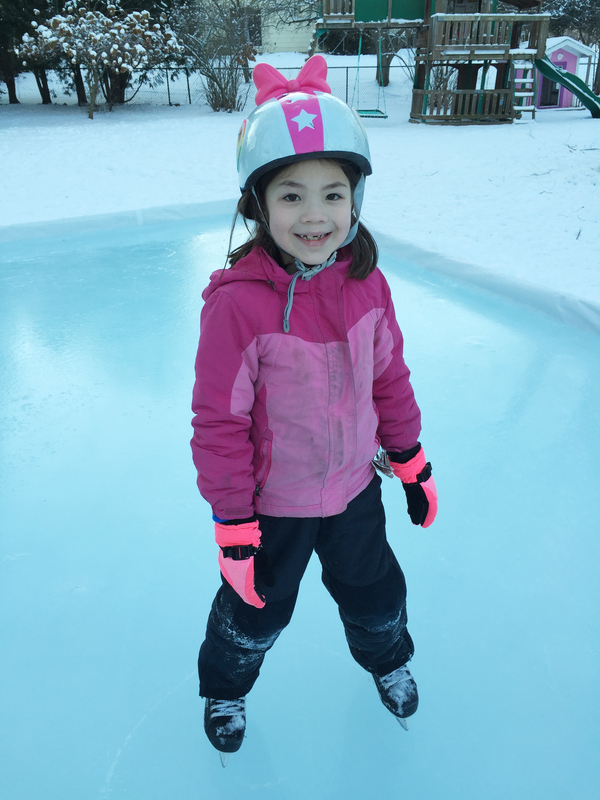 Yesterday morning, we awoke to temperatures in the 20s for the first time in five days – meaning that the ice, which had been evaporating and bump-filled all week, had somehow glazed over, leaving the surface just smooth enough to skate on. 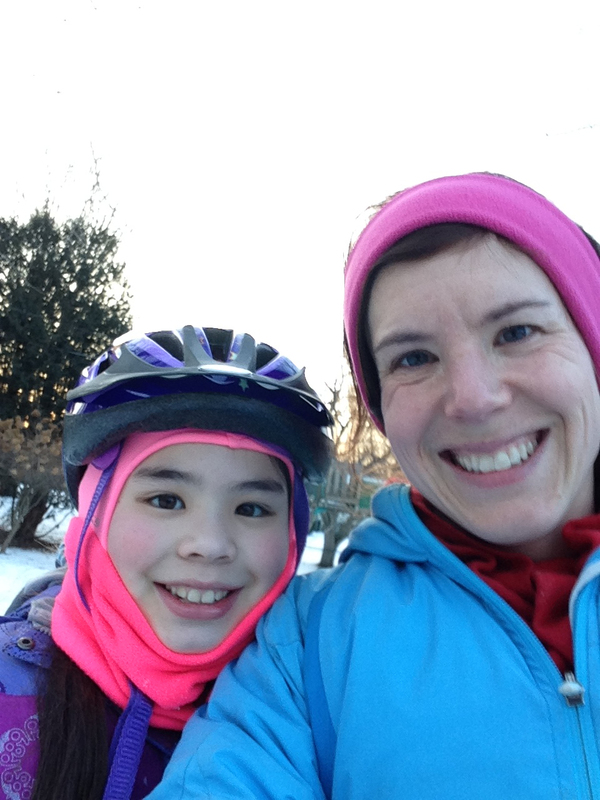 With the forecast calling for continued above-freezing days, I knew this was probably our last chance to go for a spin… and so, before school, the girls and I did just that. An hour later, I texted Nick to tell him that he’d left his lunch in the fridge – and that if he wanted to come back and get it, the ice was still good enough for him to take one last skate. 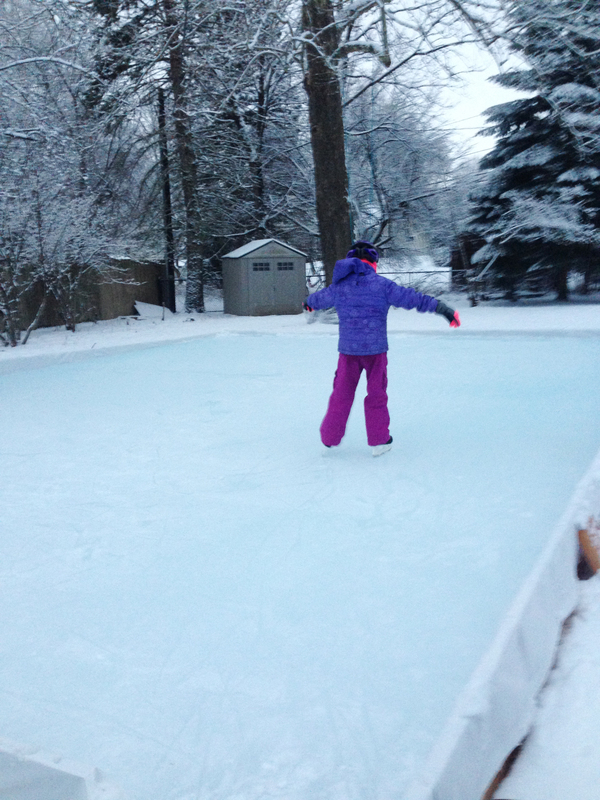 It was an offer too good to pass up; for thirty minutes, he and I went around on the rink, savoring every moment. He came straight from work; note his dress shirt and bow tie. That’s how we (he) roll(s). Soon enough, the remaining ice will turn to water. We’ll dismantle the boards and let it drain, carefully storing the pieces for the summer. I don’t know what next year’s winter holds; it’s certainly unlikely to be as record-settingly cold as this. 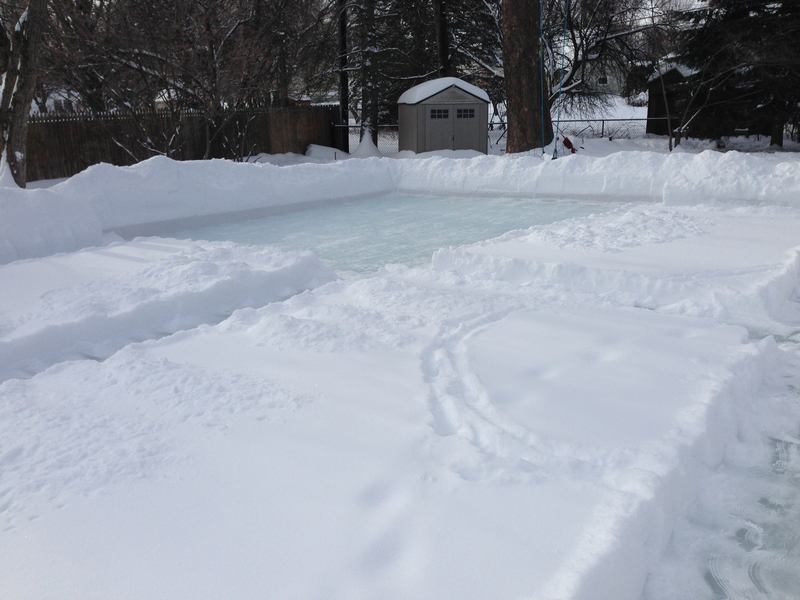 No matter what happens, though, we’ll be ready to make backyard memories again – come hell or high water ice. 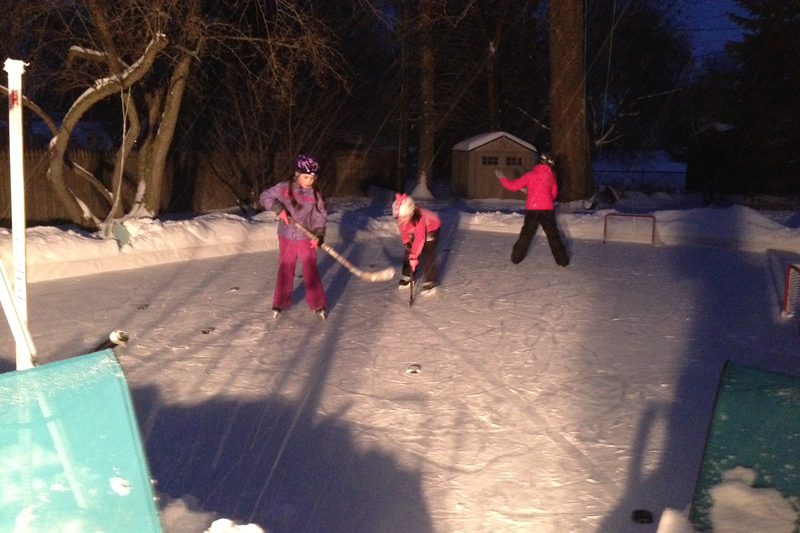 This entry was posted in good life, typical crazy and tagged Annie, backyard rink, Ella, family, hockey, ice rink, Nick, parenthood, Rochester, skating by missemtoo. Bookmark the permalink.